Part 1 Consumers and seafood: Introduction to Part 1, Consumers and seafood; Consumer attitudes and seafood consumption in Europe; Improved eating quality of seafood: The link between sensory characteristics, consumer liking and attitudes; Evaluating consumer information needs in the purchase of seafood products; Consumer evaluation of tailor-made seafood products. Part 2 Health benefits of seafood: Introduction to Part 2, Health benefits of seafood; Protective effects of fish consumption in relation to gastrointestinal health; Fish consumption and the health of children and young adults; Fish, omega-3 fatty acids and heart disease. Part 3 Ensuring seafood safety: Introduction to Part 3, Ensuring seafood safety; Detecting virus contamination in seafood; Reducing microbial risk associated with shellfish in European countries; Bacterial pathogens in seafood; Histamine and biogenic amines: Formation and importance in seafood. Part 4 Processing technologies to improve seafood product quality: Introduction to Part 4, Seafood from source to consumer product; Developing functional seafood products; Mild processing techniques and development of functional marine protein and peptide ingredients; Hurdle technology to ensure the safety of seafood products; Preventing lipid oxidation in seafood. Part 5 Seafood from aquaculture: Introduction to Part 5, Seafood from aquaculture – added value possibilities and potential impacts; The biological basis of variability in the texture of fish flesh; Fish welfare and ethical qualities in aquaculture. Part 6 Seafood traceability to regain consumer confidence: Introduction to Part 6, Traceability in a changing world; Improving traceability in seafood production; Validation of traceability in the seafood production chain. It is widely accepted that increased consumption of seafood is important in dealing with growing health problems such as cardiovascular disease. 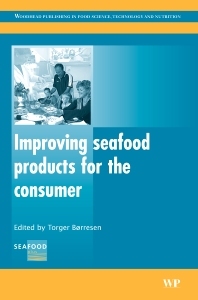 Based on a major EU Integrated Research Project, SEAFOODplus, this important book reviews the range of research into consumer attitudes towards seafood and the key issues in improving the safety, nutritional and sensory quality of seafood products to meet consumer expectations. After an introductory chapter the book is divided into six parts. The first part of the book reviews consumer attitudes to seafood, including regional differences, the impact of eating quality on product preferences, consumer information needs and attitudes to processed seafood products. Part two discusses research on the important health benefits of seafood consumption in such areas as gastrointestinal health, heart disease and the health of children and young adults. In Part three, the book reviews key seafood safety issues and how they can be managed, from virus contamination and pathogens to histamine and biogenic amines. The following two parts then discuss the range of technologies designed both to optimise the sensory and health benefits of seafood and ensure animal welfare in aquaculture operations. The final part of the book reviews traceability issues. Improving seafood products for the consumer is a valuable reference for the seafood processing industry, and all those concerned with improving the consumption of seafood products. Professor Torger Børresen is Research Director of the Department of Seafood Research at the National Institute of Aquatic Resources, The Technical University of Denmark. He is Coordinator of SEAFOODplus.